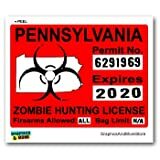 This is our 4" x 3" Pennsylvania Zombie Hunting permit. The design is Powercallsirens design. This is made from the best 3M vinyl on the market today and is installed by peeling the backing, applying the decal, then peeling off the application tape. Hundreds in stock and ready to ship. Get yours today. Many other states available, see our other amazon listings.